Incompetent architects break every architectural rule to create a Frankenstein monster that is appealing to those impressed by the grandeur. Photo from McMansion Hell website. Sold to “parvenu” – those having new money but lack the necessary refinement. The definition of parvenu on Wikipedia references Molly Brown survivor of the Titanic – who went from rags to riches overnight. (See the movie “The Unsinkable Molly Brown” starring Debbie Reynolds). Semi traditional pieces of architecture are stitched together randomly. Most people probably can’t explain exactly what is wrong with the McMansion because there are just enough traditional pieces of architecture on the building to make it look vaguely traditional at first glance just as Frankenstein looked vaguely human at first. 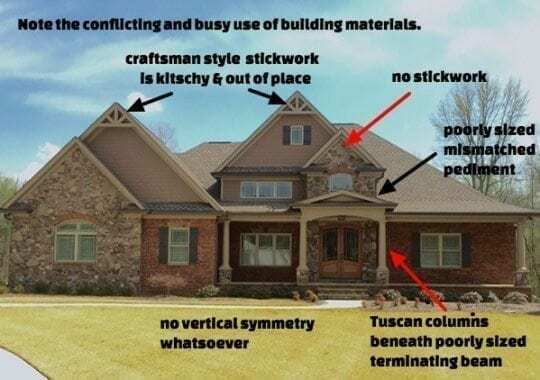 I would like to introduce you to a great website called McMansion Hell 101 . 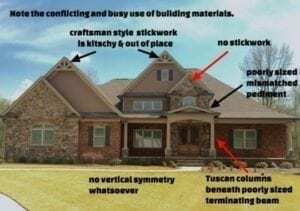 This site is extremely informative for it shows and explains the design problems with McMansions which the reader can then apply to any house to better recognize or prevent these problems. 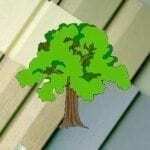 Topics such as entries, roofs, columns, windows, etc. are covered in detail. Great information for those considering new construction. 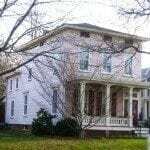 Owners of historic homes can also better appreciate and understand their architecture. Great website! Thanks for highlighting it. 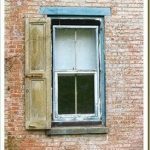 Could be a valuable resource for your next fix the botched builder grade house job. Too bad that most of these design and building quality issues are not a simple fix once they are built. 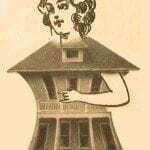 Yes – I am contacted by a lot of McMansion homeowners wondering what they can do. Almost anything CAN be done but the cost is crazy. I have been aware of this McMansion hell condition for years. All of the details you have mentioned, and it seems the more conflicting materials and design elements the better. Thanks for the share! Reading McMansion Hell gave me an education and an uncontrollable fit of laughter at the same time. I am planning to biuld a house soon, but all the contractors in my area seem to build mcmansions and mini mcmansions in subdivisions. I don’t think anyone is going to care or understand what I’m talking about. Something I still don’t quite get is how to make the roofs not have nubs; most of the floor plans out there have nubs on their roofs. I’m not sure what nubs are. If you plan to build a new house there are plans available that replicate Craftsman and traditional homes. Keep searching for a good builder that can follow plans.